No emperor on earth has ever defeated us, but when we forgot that all Jews are responsible for one another, we sometimes defeated ourselves. Now, another such defeat is within sight. All over the Arab world, nations are uniting against what Jordan’s King, Abdullah II, called the “Judaization of holy sites” in Jerusalem. In downtown Amman, the crowd called on the Arab and Islamic worlds to unify in support of Islam’s third holiest site. In Turkey, protests were held in Ankara and Istanbul in solidarity with Al-Aqsa. Even in Kuala Lumpur, thousands of Malaysian Muslims participated Friday in a demonstration to “save Al-Aqsa,” according to al-Jazeeranet. At the same time in Israel, politicians are playing the usual blame-game over who made the poor decision to remove the detectors, or who made the poor decision to place them there in the first place. Just as the Arab world uses every opportunity to unite against us, we use every opportunity to split further apart. These days, it seems we have completely forgotten this ultimate basis. It is therefore no surprise that there are clear indications that yet another defeat is approaching. And once again, it is because of our hatred for each other. Why is it that the Arabs can unite and we cannot? What makes us loathe each other so profoundly that many of us prefer to ally with our enemies rather than so much as talk to another Jew who holds a different view? Our unity did not come easily. Abraham’s first disciples came from different clans all over Babylon and the Near East. The only thing that held them together was the belief that Abraham’s tenet of mercy and love of others was the right way to live. But Abraham’s descendants did not keep their unity and ended up in Egypt, where Joseph united them once more. After his death, the Israelites abandoned their unity yet again and said, “Let us be as the Egyptians” (Midrash Rabbah, Shemot). As a result, “the Lord turned the love that the Egyptians held for them into hatred.” Had the Hebrews kept their unity in Egypt, they would not have been enslaved. Moses, realizing that the absence of unity was the source of the Israelites’ plight, cemented their unity with the pledge to love one another as they loved themselves. This is why Rabbi Akiva said, “Love your neighbor as yourself is the great rule of the Torah.”(Jerusalem Talmud, Nedarim, Chapter 9). By repeatedly overcoming their hatred, the Israeli people developed a unique method of bonding that to this day exists nowhere else. All other nations rely on a minimal level of affinity to forge their peoplehood, be it kinship or geographical proximity. Jews, however, have nothing in common unless they submit themselves to the idea that the value of unity transcends all other values. In the absence thereof, the Jews return to being people from different, often hostile clans with nothing but suspicion and enmity among them, unless an outside force compels them to unite. These unique circumstances are, in a way, a double-edged sword. When Jews are united, they are far more united than any nation on earth, since their adhesive is the belief that the value of unity transcends all other values. 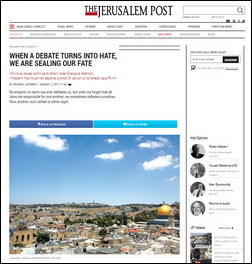 But when Jews are disputed, they are so hateful of each other that they can come to the atrocities they committed on each other two millennia ago before the Romans stormed the tormented city and massacred the remnants of its inhabitants. Today, the Jewish nation is divided both within Israel and in the Diaspora. In such a state, we are not “a light unto nations”; we radiate internal divisiveness and mutual loathing. This is why the nations, all the nations, want to see the end of the State of Israel and the extinction of the people of Israel. In his “Introduction to The Book of Zohar,” Baal HaSulam mentions the famous Tikkun No. 30 from The Book of Zohar, which states that when we Jews are not united, we “bring about the existence of poverty, ruin, and robbery, looting, killing, and destructions in the world.” This is precisely what the anti-Semites claim we bring. When Prof. of Quranic studies Imad Hamato stated, “Even when fish fight in the sea, the Jews are behind it,” he inadvertently reflected the very words of The Zohar. Our current division is inflicting pain not only on ourselves, but on the entire world, and the entire world resents us for it. Our separation unites the Arabs against us and pushes the entire world to support them. If we had unity, we would not need innovative ways to justify our country. The world would feel the benefit it would derive from the State of Israel and the Jewish people, just as today it feels the opposite. “The success of our nation depends only on our brotherly love, on connecting to one another as members of a single family,” wrote Shmuel David Luzzatto. If we could be as Sacks described toward each other, we would be “a light unto nations.” Because we are not, we are bringing on ourselves the exact same atrocities that our disunity has brought upon us throughout the ages. It will not take long before the world finds some “reasonable” explanation as to why the establishment of the State of Israel was a mistake and will revoke that UN resolution, leaving the Jews in Israel and throughout the world defenseless and persecuted once again, but this time, the world over. Torah, Deuteronomy 28:33: A people unknown to you will eat up the fruit of your soil and [the result of] all your toil. You will be only wronged and crushed all the days. Instead of correctly using the fruits of your own efforts for bestowal and love between you and the Creator, new and unknown egoistic desires appear. It is as if they jump out, ambush, and devour all that you wanted to give to others and to the Creator as evidence of your correct intention toward spiritual work. They absorb “the fruit of your soil and all your toil.” But these egoistic desires are new; therefore, they will grow from this and you will still be able to correct them on the next level. But avoiding these descents is not permitted: there are no righteous who can walk forward without stumbling. It all depends on how much you stumble. Question: What is the perfection of the Creator? Answer: The perfection of the Creator is expressed in His not being controlled by any force; He exists above all forces and simultaneously manages all of creation toward a goal that is known only to Him. Question: Who feels His perfection? Answer: Whoever attains the Creator feels Him to the degree of his attainment. Why Are There No Movies About The Book Of Zohar? Question: Why have many movies been made about the Bible, but there are no movies about The Book of Zohar? Answer: Unfortunately, there are no movies about The Book of Zohar. I hope that there will be such a movie in the future. The Book is waiting for its romantic explorer, for an expert who will discover its essence correctly and how it was passed on from one generation to the next until it was discovered in our times. I would like someone to produce a movie that would describe what is happening in a more or less accurate manner. Question: Does this mean that you are critical of Hollywood movies about the Bible stories? Answer: It is a complete distortion of spirituality, Hollywood in its most loathsome, revolting form. It is very important that a real and candid movie about The Book of Zohar be produced that will tell people about this book. I hope that it is yet to come.